Elen Hughes won 'Best Stand' at the Student Christmas Fair as well. Her business will be put forward for the next round of the Santander Universities Competition.Two new categories have been introduced this year for the Santander Universities Entrepreneurship Awards; ‘New technologies and mobile applications’ and ‘Important day-to-day products and services’ and applications could be at Idea stage or a launched Start-up project or business. Two winners emerged from the Important day-to-day product and service entries. Bangor University’s judging panel deemed education student Thomas McCarley and Elen Hughes of the School of Welsh equally deserving of an Award. Following an additional round, it was decided that Elen should go forward to represent Bangor University. 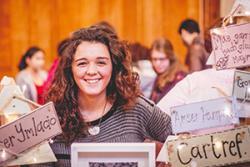 Elen Hughes from Cricieth has already begun her small business creating personalised art-work for all occasions, and hopes to start selling her gifts in local shops and increase the scale now that she’s about to complete her degree in Welsh. Click here to view a short fideo about Elen's company- Ffranc. Thomas Mc Carley comes from near Ammanford. Although studying to become a qualified teacher, Thomas has branched out into making high quality hand-baked gluten-free dog treats. The idea came from a desire to provide his own dog with highly nutritious food. He has begun selling the treats locally and his next step is to scale the product and attempt to get it on sale in more stores. Having been given further tasks, the judges selected Elen to represent Bangor University in the next round. 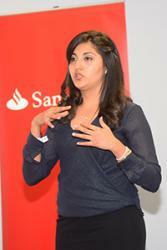 Suita Diaz pitching her idea to the Santander Universities Enterpreneurship Awards.Representing her idea in the same category is Suita Diaz of the University’s Business School. Suita comes from a family of coffee growers and traders in her native Honduras and is passionate about her model of trading coffee directly to British coffee drinkers, which she hopes will directly benefit the Honduran growers. Twenty five year old Suita is studying an MA in Business and Marketing at Bangor University through a Chevening Scholarship. She has graduated from Universidad Tecnológica Centroamericana, UNITEC (Honduras). The New technologies and mobile applications idea categories went to a student team called My Stryd, with their app to encourage an increase in footfall in the high street. Team members Nikita Savy, Sabria Behilil, Jack Morris, Leon Gartland and Aleksandra Kozłowska combined their various expertise in psychology, banking & finance, electronic engineering, journalism and media and game design and development to develop their ideas. Their app has the potential to reinvigorate interest and shopping on Bangor’s High Street by means of a dual interfaced gamification app rewarding consumers with points for entering local stores; local businesses gain high quality demographic data on their customers for their mutual benefit - a model that can be replicated in other towns across the country. The team are delighted with the results and are excited to see the new opportunities that await them. They have received interest from businesses and Pontio Innovation, and are currently looking into starting the development stage for a prototype and polishing off some features which should be ready to show if they make into the UK Finals. The winning My Stryd team with judges, Siwan Mitchelmore, Aron Owen and Andy Goodman (Prof John Hughes had to leave for another appointment).Speaking on behalf of the Team Leon Gartland said: “The opportunity to take part in a competition like this can challenge you to bring out the best in yourself and I would recommend any student who is given the opportunity to take it and make the most of it. It could lead to great things and maybe even lead to a future career, and make you more employable in the future. 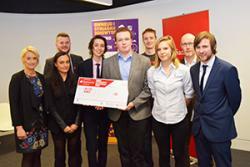 Each winning category was awarded £200 and will receive further mentoring support to develop their business planning. The Bangor University stage of the Santander Entrepreneurship Awards is part funded by the Welsh Government to support delivery of the Youth Entrepreneurship Strategy (YES) for Wales.